Turn ANY Bike Trainer, Exercise Bike, Treadmill, or Rowing Machine into a Virtual Reality Experience for home and club use. 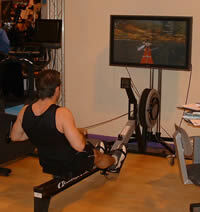 RA Sports is offering users a unique solution for PC interactivity for cycling, running, and rowing. 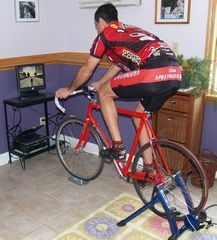 Using Wired Technology, you can now and in minutes make your bike trainer, exercise bike, treadmill, or rowing machine, PC interactive and into an expensive training device for on and off Internet training. 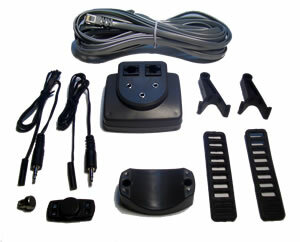 Partnering with a wired hardware manufacturer, RA Sports offers you this breakthrough product. The Peak Training System Sensor Kit works with any bike trainer, rollers, spin bikes, exercise bikes, treadmill, or rowing machine. All that is needed is a spinning wheel, and the speed sensor will pickup the speed. Peak Training System is easily setup with all the needed sensors, holders and straps included in the kit. You will be able to install in minutes. 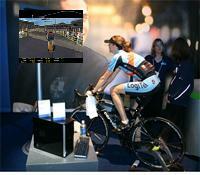 The NetAthlon software is also very user friendly, with it's easy setup, you will be riding in minutes. Does the system work with any bike trainer, rollers, spin bikes, exercise bikes, treadmill, or rowing machine? Yes, what is needed is to attach the magnet to a wheel and the sensor will pickup the spinning of the wheel for the speed. For bikes, the cadence sensor will connect on to the crank arm. Does the system adjust the resistance on a bike trainer? The system does not adjust the resistance on your bike trainer, but you will see the hills coming at you, and in the info box you will see the grade increasing. So what you can do is, when you are going up hills, you can down shift for more resistance. This will give you the workout and will improve your form and balance for when you are on the real road. Does the system measure Heart Rate? Yes, you can use a Polar Heart Rate wireless receiver and hook it to the same Digital Signal Processor box where the speed and cadence sensor gets connected. You can purchase the Polar HR receiver as an accessory from our e-store. Easily connects your PC to any exercise bike, bicycle trainer, treadmill, or rowing machine. Race solo or against computer generated riders. Train against saved rides to re-ride again later. Connect to the Internet and ride or race against online rides. Displays performance data such as speed, cadence, time, distance, power, heart rate. Same software used as the other more expensive compu-competitor.